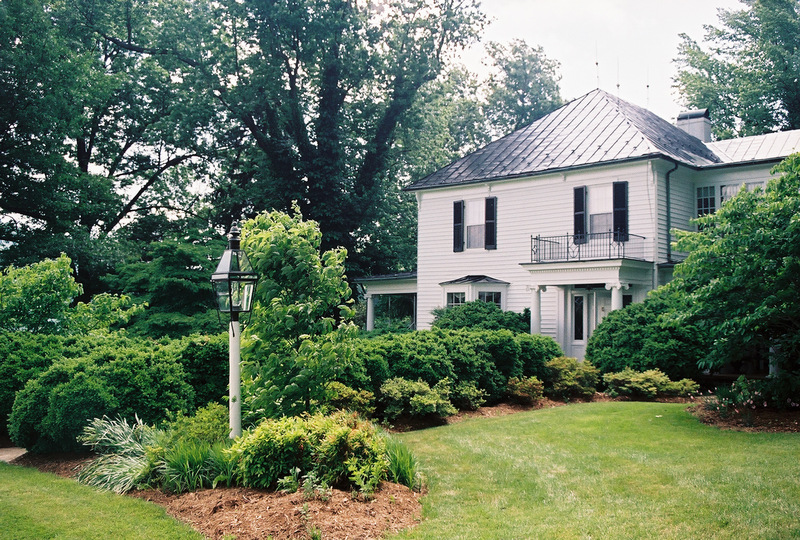 It all began in 1984 when my husband Tom and I purchased a home in Franklin County. Although the home was built in the late 1800’s, we would become only the third owners. We chose this house because our eight-year-old daughter, Amanda, had been longing for a horse. Our new home had a small barn and plenty of room for grazing, it was perfect! We quickly settled into country living. After seeing our children, Amanda and Emily, off to college we began to seek new adventures for ourselves. In 2003, Tom accepted a job in Louisville so we packed up the house and started another chapter in our life. We, however, kept our family home hoping to return here in our retirement years. Soon after our move, Amanda announced her engagement and her desire to be married at our Roanoke home. After we settled on a July wedding date we began to plan their wedding from a distance. Amanda and John’s wedding was a beautiful southern garden party. Starting with cocktails under the large magnolia trees continuing with fun and laughter well into the night as we celebrated the lovely couple. 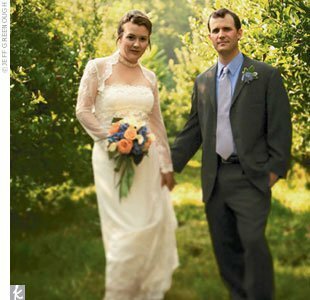 Several months later, we learned that the photographer, Jeff Greenough, had submitted Amanda and John’s wedding to The Knot. Soon after the wedding was published we were contacted by couples interested in hosting their own weddings on our property. We agreed to try a few events to just see how everything went. As a former high school teacher, I loved the idea of being involved with young people again. So, for three years I travelled from Louisville for each wedding. With business quickly taking off we made the decision to return home and settle back into country living. One day I began reading a book, to this day I can’t remember the name of the book, however one thing stuck out to me. The book referred to a Hindi word “sundara” meaning ‘beautiful’ and in that context, specifically, ‘a beautiful place in life’. When it came time to name our new business, Sundara was my most obvious choice as it was a beautiful place in my life and many others. Since we opened our doors in 2003, we have had numerous weddings published in local and national magazines. And have been honored by The Knot, Virginia Living Magazine, The Roanoker, and nominated for the Small Business of the Year Award. Along our journey we have learned the value of supporting our community and neighbors; by participating and hosting many events for The Roanoke Symphony, Healing Strides, March of Dimes, and the Blue Ridge Land Conservancy we have found a way to give back for all that has been given to us. Now entering our 14th year in business, and already looking ahead to a promising 2018 we must thank our wonderful clients and staff for supporting our dream and helping us create such a successful and meaningful business. Are you still in search of the perfect venue for your wedding? We still have several 2015 and 2016 dates still available at Sundara! Until February 28th, we are excited to offer a “Twice as Nice” booking incentive, alongside our in house caterer, Blue Ridge Catering. 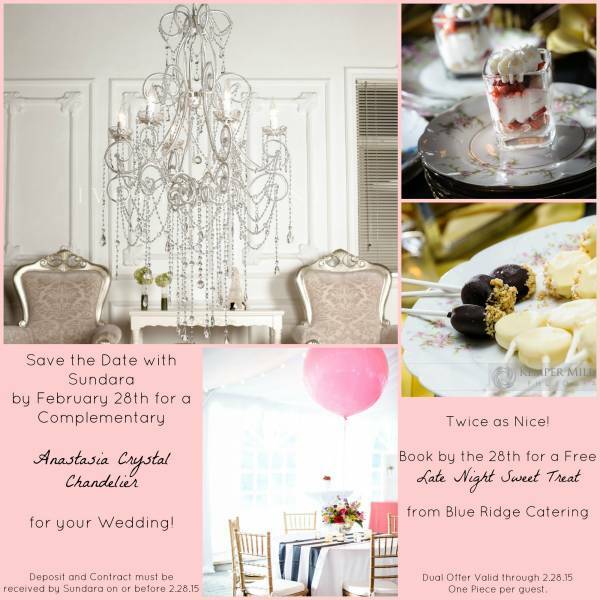 Save the Date by February 28th for a complementary Crystal Chandelier installed for your reception AND a Late Night Sweet Treat for all of your guests to enjoy! Think cheesecake lollipops, macarons, strawberry shortcake trifles, & more! I woke up this morning thinking about SOUTHERN hospitality. What is it? Growing up with very modest means in a small bungalow in the country there were certain unspoken lessons that remain with me today. There was no money for opulence or as we called it then “putting on the dog”. Hours were spent cleaning, scrubbing, polishing, weeding, putting our best foot forward. Most importantly, you knew someone was coming to visit and you wanted them to feel that you were excited about their arrival and yes, maybe even bake a cake! What ever you had, however meager, was to be shared to make guests feel welcome. Think about visiting someone for the weekend. The lawn is not mowed, the house in disarray, no food prepared, the television blaring as you sit to talk. Do you feel that anyone is excited or at the least happy for you to be there? As we are working on gift bags for an upcoming nuptial to be placed in the hotel rooms for out of town guests, I’m thinking about how we can make these reflect our southern hospitality here at Sundara. To be sure, the items placed must be meaningful – don’t think we’ll be just throwing in stuff just to fill the bag! The small details of your wedding, (whether you decide to do gift bags or not) deserve careful thought. And it is very important to work with vendors who share your vision of how you would like your special day to unfold. The wedding is all about the bride AND the groom AND also the guests. If the bride and groom stay true to themselves and host a wedding that reflects who they are, that is a step in the right direction of making guests feel comfortable. It takes more than money to make guests feel welcome and that’s where Sundara’s southern hospitality comes in!